What sets Baja Sun Real Estate apart from the rest? Our relationship with you! We offer our clients experience, motivation, and a willingness to work hard. The difference between realtors is Service & Knowledge. If you are a Buyer, allow Baja Sun Real Estate to guide and assist you with your purchase. We can help make sure the property you are considering is transferrable and we will inform you of all costs associated with the purchase before you make your decision. If you are a Seller, take advantage of our internet advertising with the goal of getting your property sold. These days, most Buyers start their search on the internet. Our websites dedicated to San Felipe real estate place high on the search engines and we advertise on all the major sites pertaining to San Felipe. In addition, Baja Sun Real Estate actively co-brokes with all other agencies in San Felipe, as well as Northern Baja California. Our goal is to make the process of buying, selling, or owning a home efficient, enjoyable and rewarding for you. Baja Sun Real Estate "Best Real Estate Broker" of 2014 & 2015! "As a buyer, I'd highly recommend Darryl and Michelle at Baja Sun Real Estate. They do take the time and money to do things properly (unlike many!). They're a leading part of helping cleaning up the real estate business in San Felipe with AMPI and (finally) real professional training and licensing. During the lean last few years, when the "part-time" real estate agents have been running stores or have left town totally, Darryl and Michelle have been sticking at it with good online marketing (beyond the local websites) and low overheads, and are now getting some steady sales when the asking prices are realistic." "I, as a seller, was absolutely delighted with Darryl & Michelle. They are the perfect team ~~~ honest, dependable, always keeping all parties in the loop. I used their service to sell one of my town properties and could not have been more pleased with the results and them personally. They represented both parties fairly, legally and with great patience. I highly recommend them ~~~ they did an outstanding job for me." "I have had the good fortune of finding and utilizing the services of Darryl McDonogh. I found him to be the penultimate in professionalism. He was reliable and was always available when I needed timely feedback and directions. He has exceeded my expectations insofar as he has assisted me in completing unfinished business with El Dorado Ranch after the sale of my property. Darryl McDonogh is highly recommended by this very satisfied client." "I have known Darryl and Michelle for many years. They are business friends as well as personal friends. They have always gone above and beyond in their customer service for me whether it be the selling of my condo, other transactions or just questions I’ve had regarding real estate in San Felipe… I am grateful for their help, services and friendship." "Darryl is an excellent and highly reliable Real Estate agent. He is knowledgeable, honest and has a great sense of humor." "My wife and I purchase a home in El Dorado Ranch. Our agent was Darryl McDonogh. I am 63 years old and have purchase several homes in my life time. I can assure you that Darryl is heads and shoulders above them all. The time and help he has given my wife and I is off the charts and he is still helping us. I would recommend Darryl McDonogh to everyone that is interested in Mexico property. Trust me he is the very BEST!" "Best agents no one better period"
"Darryl McDonogh is possibly the BEST Realtor we have had the pleasure of working with. We live in Oregon and were not readily available for all the necessary transactions needed to purchase our property in El Dorado Ranch. Darryl went above and beyond the call of duty to take care of all the details for us. He patiently answered all of our many questions and explained everything in detail. Our transaction went smoothly and we couldn’t be happier! Thank you Darryl, for a pleasant experience in purchasing our first property in the BaJa!" "Darryl McDonogh served us well in every way. He was a great communicator with both sides of the sale; he watched out for our best interests by anticipating things we were not likely to think of; he was knowledgeable, honest, straightforward, and responsive. We sincerely appreciate Darryl's expertise and professionalism." "My casa in La Ventana del Mar had been listed with El Dorado Ranch for quite some time. Darryl McDonogh was recommended to me as a realtor who would give me a fair and honest opinion of value and then work hard to sell my casa. We settled on a listing price and Darryl went to work immediately to find a buyer. After just a few months we had the casa sold at a fair price. During the process I was extremely impressed with the level of Darryl's expertise regarding the intricacies of Mexican real estate and tax laws. He guided me through the process without a single problem. Without hesitation I recommend Darryl and Baja Sun Real Estate to both sellers and buyers. They are the go to real estate agency in the San Felipe area." "My wife and I had been looking for a Mexican home for over 2 years. Needless to say we spoke and met with several realtors over that time. None came even close the level of professionalism as Darryl! He is far and away the very best that we had dealings with. He understands all the ins and outs of his market, knows each and every home that is on the market. Darryl went way out of his way to show us each and every home that we wanted to see and suggested others that we did not know about. He knew everything there was to know about these homes and had all the information in his head, not in some binder he had to look at, and was ready to answer any questions, and offer insights. He is a great people person, is as honest as the day is long and I can not say enough good things about him and his service. I will use him again, I highly recommend him to anyone even remotely considering buying a Mexican home. I consider Darryl not only my realtor, but my first friend in the Baja!!" "My mom hired Michelle to help her sell some lots she had in Mexico. We could have never completed the transaction without Michelle’s knowledge and expertise. She quickly responded to our questions and helped us navigate the Mexican real estate laws. Michelle is awesome!" "I am not a business person and do not even know the English language as well as I should in order to write this recommendation. I had no idea how to begin when it came to selling our vacation home at the El Dorado Ranch. When someone gave me the name of Darryl McDonogh I was scared to death to do business with a total stranger. Everything had to go via email or regular mail (I am too deaf to use a telephone). The last time we stayed in the house was in 2006. We had to leave in a hurry because my husband got very sick and wanted to go to his own doctor in the United States. I had no time to clean up in and around our house. From the very first email I got from Darryl, I felt a lot better. Darryl had a look at our house. Told me what had to be done to make it sell-able. He offered to take care of everything, so that I absolutely did not have to travel to San Felipe during the whole process. I knew ahead of time everything he had to do and he kept me up to date at all times. When it came to the final sale he explained every form that I had to fill in and how to return the notarized documents (by express services). By now I consider Darryl and Michelle as very helpful friends. They know all the rules of the business very well and have a very clear way of explaining it. The whole experience was very nice." "Meeting and getting to know Darryl and Michelle at Baja Sun Real-Estate has been the best possible experience we could have hoped for when we started looking for a house in San Felipe. We had visited the area many times before deciding to look at available houses and were fortunate to be introduced to Darryl for some tours. It was clear that he and Michelle have the most complete knowledge of the local market and in getting to know them we discovered they were just great people who took an interest in setting us up with a property which was the best choice for us. Their excellent guidance gave us the confidence to purchase a beautiful house which has worked out perfect! The thorough managing and “hand-holding” they provided made the process very smooth. We now count Darryl and Michelle as two of our closest friends and it is always a pleasure to visit with them and do so as often as possible. We feel fortunate to have become a client and friends of Darryl and Michelle at Baja Sun Real-Estate and recommend them highly!" "Darryl, I wanted to take a moment to thank you for great service you put into my closing of the house. I appreciate your attention to detail and to time you took to get answers to my questions regarding the contract. My highest regard to your professionalism in working with the attorney. Thank you very much." "If your looking for a knowledgeable Realtor doing business in Mexico, my wife and I highly recommend Darryl McDonogh. We had been trying to sell our house in San Felipe, Baja California for quite some time. Darryl was recommended to us by a mutual friend. We hired Darryl to sell our home and it was the best decision we could of made. Darryl is very knowledgeable on how to sell Real Estate in Mexico. We definitely needed his expertise to get our house sold. As an American, selling a home in Mexico can be very difficult. Darryl was able to find us a cash buyer and help us work through all the road blocks that came up to getting our house sold. We would not hesitate to use Darryl as our Realtor in the future." "Darryl was very effective in devising a strategy to sell our lot quickly. He priced our lot well, marketed it, and got a full price offer within a short period of time. Darryl also did a great job educating us about the closing costs and timing and provided us with the requisite forms early so we could arrange for proper execution, including a notary. If I had other real estate in Baja I'd use Darryl again and if asked, I would definitely recommend him to others interested in selling property." "I want to thank you and Darryl for your honesty and integrity, virtues we have seen sorely missing in our recent dealings with EDR. We're aware of the desperate turn of events at El Dorado Ranch the last few years and it has been frightful for us, being so far away. We are so relieved and grateful to get out from under this, our Holidays will be far more joyous thanks to you." "Michelle and Darryl This is long overdue but I wanted to thank you for all you've done to sell my condo. It is a big relief on my part. You handled everything very professionally and went out of your way to get things done without me having to go down there. I really appreciated that. I wish you all the best with Baja Sun. I know you have a thriving business going due to the way you handle everything and your knowledge of what's going on down there." "After owning a lot on the Baja at the El Dorado Ranch in a solar area, I needed to sell my lot. I picked BAJA SUN REAL ESTATE. They did a great job of working with me to sell my lot in under 6 months. They are easy to work with and do a fine job. Thank you again..."
"I love their services!!! Darryl and Michelle helped me get through the most difficult time of selling my house. They jump through hoops and they went beyond their required services to help me close escrow on my property at El Dorado. I will forever be grateful for everything they did professionally and emotionally. Their team selling my house made every process go smoother. I highly recommend their company. Thanks Again!!!" "Darryl and his team at Baja Sun are not just great Mexico realtors, they are great realtors period! I was truly impressed by Darryl’s attention to detail and willingness to get his hands dirty when needed. Our situation was challenging and Darryl put my wife and I at ease, clearly set reasonable expectations and then exceeded them! Great communication, integrity and doing what it takes to make things simple for his clients and get results are what Darryl and his team are all about." "We appreciated his candor in describing the house we saw on his excellent website. We were unable to travel to see the house due to a family matter. We purchased the house anyway, based on his descriptions, and you can rest assured his descriptions are very accurate. We completed all of our transactions without ever having to go to San Felipe, and Darryl provided the instructions and paperwork for each phase, as if we were in the same room. When we finally were able to travel to San Felipe, it was a delight to meet Darryl, who then took us to the house. Even more amazing was the house was actually more than we expected and we are delighted with every aspect of it. Darryl is a warm, friendly, no nonsense man. You will be delighted to work with him." "First and foremost I would like to thank Michelle and Darryl for their tireless effort in assisting with the sale of our property. I was at a very low place in life after I lost my mother and father. I had never sold property before and especially property in Mexico. Both Michelle and Darryl helped me through the entire process,step by step. They ended up turning the saddened time in my life into a bearable and positive situation. They both were available to me 24/7 and calmed me down when I felt all had failed. I'm extremely happy with the outcome of the sale of the property that my father worked his entire life for. I would recommend Baja Sun Realty to anyone needing to buy or sell property in Mexico. Thank you both from the bottom of our hearts." "We were extremely pleased with Darryl and Michelle from the beginning of our selling process until the end. We listed our home in El Dorado Ranch and they took care of everything else. Both were very professional and knowledgeable and kept us in the loop at all times. As we all know, rules and regulations are constantly changing in Mexico, and Darryl is on top of it! He represented both us as sellers and the CA buyers honestly and fairly. We highly recommend them and would work with them again." "I have been both a buyer and a seller with Baja Sun Real Estate's Darryl McDonogh and Michelle Walters. They have been very helpful and knowledgeable throughout both the buying and selling process. Michelle does magic with her camera artistry to get the best pictures of the property. Darryl pays close attention to every detail and assures everything is done legally and correctly. His honesty and professionalism is excellent. I do not hesitate to refer them to anyone. I have known them for six years." "Working with Michelle Walters on selling property at La Ventana Del Mar (El Dorado Ranch) has been a pleasure. Michelle is knowledgeable, a true professional, and provided the highest quality of service. 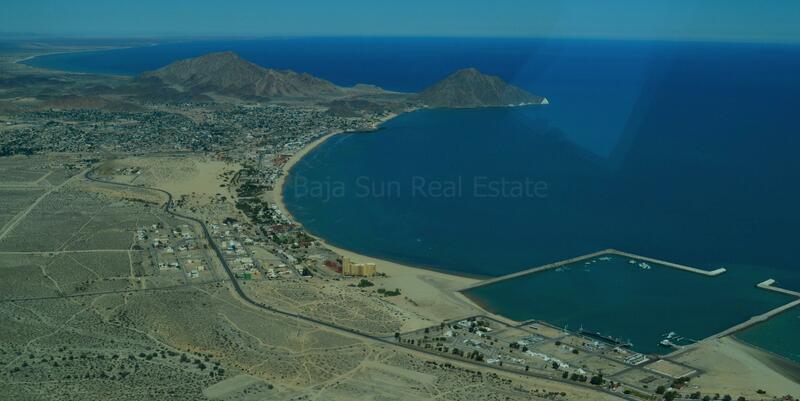 I highly recommend Baja Sun Real Estate to anyone who is seeking to buy or sell property." "Our experience with Baja Sun was – in a word - fantastic! Darryl is extremely knowledgeable, honest and caring. He was able to sell our house in six weeks at our asking price and made all the paperwork and red tape easy. We structured the payments over two years and never had any issues. We only had to be in Mexico for the original transaction, everything else was handled by email and wire transfers. In my ten years owning property in San Felipe I saw a lot of realtors come and go and there’s a reason why Darryl is still there: he is the best realtor in town." "As a seller, we were EXTREMELY happy with our experience with Baja Sun Real Estate. We have vacationed the last 17 years in the San Felipe/El Dorado area, and when the time arrived to sell our casa, we chose Darryl and Michelle to represent us in the process——-without question we made the correct choice." It is truly a pleasure to write this letter to sincerely thank you for helping us sell our property in Mexico. In all honesty thanks is not nearly enough. My wife and I came to you hoping to sell our property with the expectation that it might take a considerable amount of time to find the right Buyer for our home. We had tried for over a year to attract a buyer on our own without success. Imagine our surprise when you were able to find a ready, willing and most importantly, able buyer within the first couple of weeks of listing our house. We hope this letter will explain why we believe Baja Sun Realty is an exemplary real estate firm and by far the best in San Felipe. From the time of our first meeting you were both brutally honest and direct. This was certainly appreciated since we found ourselves in a situation where we really needed to sell our property quickly. You made us feel comfortable and clearly knew the market and the players involved in the local market. You listened to our needs and helped us decide on a fair asking price. You clearly explained the marketing plan and the sales process including the tax implications and the role of the Notario in Mexico. You were able to break down this very complicated process for us and even made it seem easy. We can say without exaggeration that you both provided unparalleled support and expertise throughout the sales process. You made us feel like we were partners in the transaction and instilled confidence by keeping us updated and clearly communicating each step from the Purchase Contract through Close of Escrow. For all of the above reasons we can say without hesitation to anyone wishing to buy or sell real estate in San Felipe that Baja Sun Realty has earned our highest recommendation. Thank you from the bottom of our hearts! Very Sincerely..."
"Darryl was the answer to a prayer for us, as we were discouraged after having the house listed for almost 3 years with another agency and no having much contact with the other realtor or any bids. After 10 years of enjoying our home at Eldorado Ranch, health problems forced us to sell and we made the decision to contact Baja Sun Real Estate. Darryl had the house sold in just 3 months and he went above and beyond his duties to help us! The cleaners had taken down the blinds and removed other items after we had gone back to the States, so Darryl went to the house and reinstalled them, put back the items that were in storage and then went out of his way to make sure that all went through perfectly!! We were so happy that we were able to put our trust in his hands, and we know that not everyone is as professional and reliable". "We had been trying to sell our Eldorado Ranch house for yrs with no success. After using other local RE offices with no luck Baja Sun was recommended to us by a neighbor who was very happy with their experience with Baja Sun RE. So happy to now say the house has sold. We cannot express enough our gratitude to Darryl and Michelle for their hard work. When issues came up with the complexities of real estate transactions across borders Darryl was there to help us. We can honestly say that Darryl went above and beyond in his effort to get this sale on paper and closed. We highly recommend Baja Sun RE as a honest, hard working, and professional agency for buyer and seller alike. We are very grateful. Thank you,"
"After much searching and indecision we finally found a place we set our hearts on. Darryl and Michelle were exceptionally helpful, knowledgable, courteous and straightforward in helping us with our purchase. They are professional and forthright, and go the extra mile with a smile. Their knowledge of the area, and of the intricacies of navigating the Mexican system of purchasing real estate was invaluable. We highly recommend Baja Sun Real Estate and the two wonderful people who own and operate it!" "Very knowledgeable, honest and helpful." "This is to add our high marks to many others who have used the services of Baja Sun Realty to sell their home. Bill and I can't say enough about Darryl and Michelle, and the professionalism with which they conduct their business. They are able to connect just the right buyer and seller at a fair price to both. We received our final payment, the last of three, and were very happy to hear that the new owners of our home in Hacienda del Sol "love their new home." Darryl and Michelle, it was a pleasure working with you both."